Chef Sonja Finn (at left) and Chef de Cuisine Becca Hagerty (right) are making a statement with beautiful yet down-to-earth food at the Carnegie Museum of Art’s Café Carnegie. Chef Sonja Finn and Chef de Cuisine Becca Hagerty create a deliciously iconic menu at the Carnegie Museum’s new Café Carnegie. Pittsburgh chef Sonja Finn has opened a restaurant in the Carnegie Museum of Art, and the menu is meant to inspire with food that’s seasonal, locally sourced and expressive, yet totally real-deal and approachable. Finn brought that same sensibility to the Café Carnegie, along with one of her top employees from Dinette, Chef de Cuisine Becca Hagerty, who oversees day-to-day operations at Café Carnegie. Hagerty’s specialty is incredible fermented dough and ethereal bread in baguettes and pullman loaves. The café, which seats 100 and opens up to seat about 20 more outdoors during the summer, opened in December with Culinaire as the management company. The process began almost two years ago, when Finn worked with Culinaire on a proposal for the café at the museum. During that time, she ran a grab-and-go operation at the Andy Warhol Museum (also in Pittsburgh). Seasonality has always inspired Finn during her culinary career, and while the Dinette menu can change practically every night to suit what’s in season, the café at the museum has just one menu per season that stays fixed. That was an adjustment for Finn. “When looking at the winter menu, I looked at what would be available until we hit spring,” she says, describing conversations with local purveyors of fresh produce, turkey, lamb and more. Responsible sourcing, sustainability and urban gardening are all things that Finn takes seriously. She scoffs at the idea of kitchen herb gardens that are just for show, proudly describing a 70-container garden on Dinette’s rooftop that supplies a large portion of the restaurant’s produce. Another guiding principal in planning ongoing menus for the café is the fact that, in Finn’s eyes, a museum café should provide not just great food but also a sense of place and a sense of occasion. 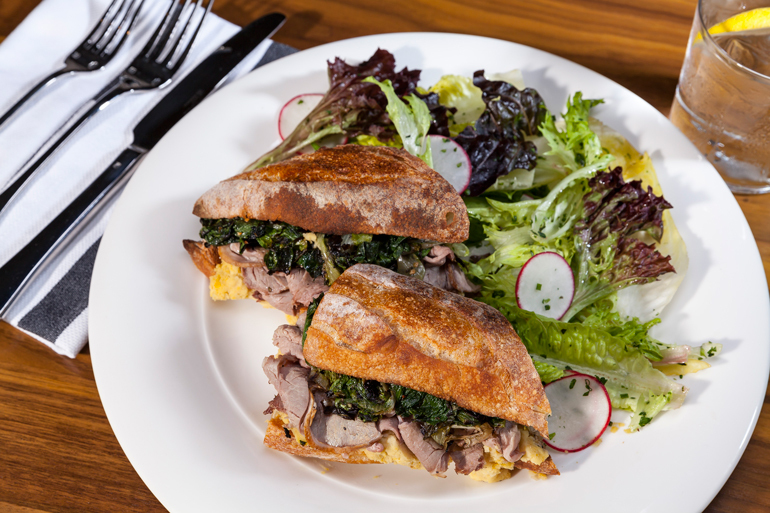 At lunchtime during the week (every day except Tuesdays, when the museum closes), and at brunch on weekends, Café Carnegie is serving sandwiches, big pasta plates and salads. An attached coffee bar serves a limited menu during expanded hours. One of the best-sellers at the café so far has been the club sandwich, another thing Finn is truly serious about. Incorrectly, according to Finn, means omitting “the club layer” (that extra slice of toast in the middle of any self-respecting club sandwich). Other standout menu items include entrée salads like pulled chicken salad, winter farro salad with roasted apples and blue cheese, salad chevre chaud with goat cheese melted on a baguette over lentils, greens and roasted carrots. The menu for brunch (served on weekends) includes luxurious items like oysters on the half shell, deviled eggs with Berkshire prosciutto, bocadillo de tortilla (a pressed potato sandwich with Latin flavors) and of course, a brunch club sandwich with house-cured salmon, pea shoots, herbs and caper mayo. And the kids’ menu is no slouch, either. Finn, who has taken her young son to museums throughout his life, recognizes what a big deal a museum visit can be to a kid. The star of the kids’ menu has been le hotdog, inspired by hot dog stands in Paris that naturally use great bread. Hagerty’s baguettes are perfect for the all local beef hot dogs, which have also become popular with museum employees looking for a quick, inexpensive lunch. 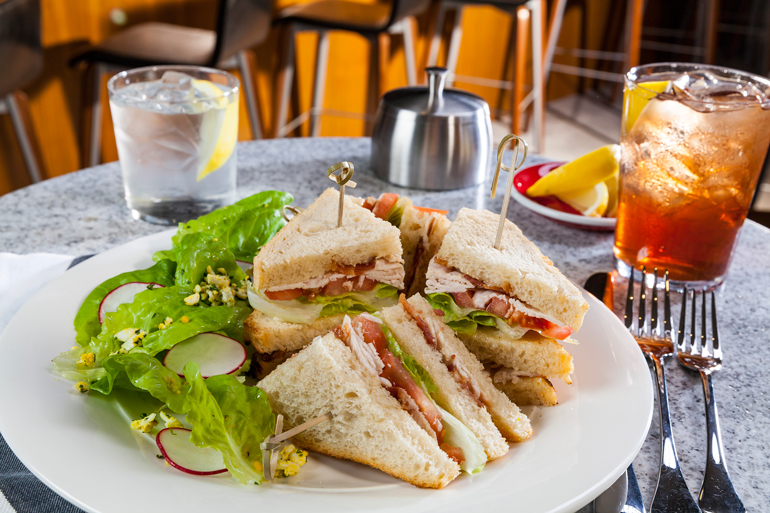 Kids can also choose from little tea sandwiches, a shrimp cocktail, peanut butter-banana-honey panini and English muffin sandwiches at brunch. At the moment, Finn says she’s already looking ahead to this summer at Café Carnegie, when local tomatoes will serve to inspire a new seasonal menu.